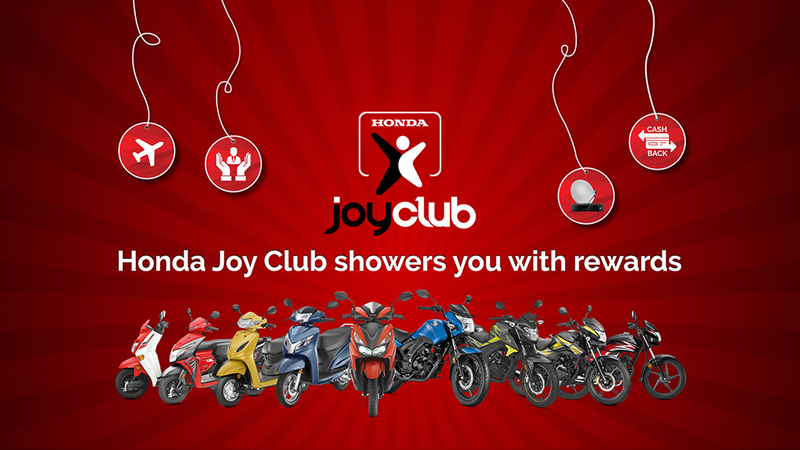 Honda Joy Club is an exclusive engagement program designed especially for our ever- growing Honda family. It is a unique initiative by Honda Motorcycle and Scooter India Pvt. Ltd. enabling the customers to enjoy maximized privileges and benefits. The member will earn a credit of ₹299 Honda Currency within 72 hours of registration. Refer your friends and family for a new Honda Two Wheeler today to earn bonus Honda Currency. Honda customers owning a Honda Two Wheeler can exchange their existing Honda Two Wheeler with a new one and earn bonus Honda Currency. All Registered members will get a complementary accidental insurance cover of worth ₹1 Lakh for a period of 3 years. Enrolled members will get the access to exclusive partner brands and offers. Cashback upto 200 powered by various E-Wallet. 500 off on the new HD Set Top Box. Attractive discounts on Network Pharmacies & Diagnostic Centers. Travel Discount vouchers Upto 5000. Honda Currency is referred to the credit of Virtual currency in lieu of points earned against transactions made at Honda Motorcycle and Scooter India Pvt. Ltd. Authorized Network. Honda Currency earned cannot be transferred. Honda Currency cannot be exchanged for cash. Honda Currency is redeemable only within Honda 2 Wheeler Authorised Network. The Mechanism of Earning and Burning Honda Currency is subject to change without prior notice.